EconomicPolicyJournal.com: Rand Paul Lets It Rip: What is Our World Coming To? Rand Paul Lets It Rip: What is Our World Coming To? This is the best thing, yet, that I have seen Senator Rand Paul write. drifts toward the socialism of Western Europe, Western Europe regulates itself in the direction of Eastern Europe. Meanwhile, the failed Soviet satellites of Eastern Europe yearn for the freedom and prosperity that made America great. Ladies and Gentlemen, we are seeing a statesman being born when we desperately need one. Stick to your guns Rand! Hopefully that won't all go into the toilet again when he runs for president next time. He might well be president now had he not abandoned his supporters. Exactly. If he would stick to these guns like his dad, he'd have given the GOP a good show. Rand is best when he isn't pandering to the neocon party-line. Nobody really likes milquetoast. Hopefully he's seeing the impact he's had with the Liberty Caucus and Obamacare and is actually learning a thing or two about sticking with the real right-wing conservatives. There is nothing "right-wing" about capitalism or liberty. The far left and right are both the same nonsense predicated on the supremacy of the state and central planning. One side is the complete organization of society by the state according to some arbitrary definition of "fairness" and the other is the complete organization of society by the state according to "tradition". Both are tyrannical. Both are anti-Liberty. To describe the right-wing or left-wing as pro-liberty is to pick a form of tyranny to live under. It is a false choice. 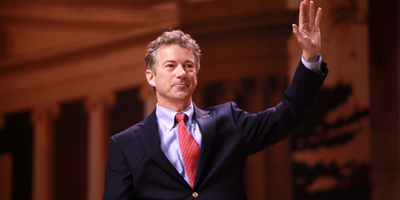 Rand is pro-liberty but Liberty defies the traditional Left-Right spectrum. To call it centrist is also to miss the mark as it would make liberty some form of compromise between the worst society has to offer on both sides. To be Pro-liberty is to be Apolitical as politics itself is anti-liberty. The meaning of "socialism" to most people is no longer a centrally planned economy, but a tightly regulated one with fairness and redistribution paramount. Even my most progressive friend does not want the government to take over business, just to milk it for all it's worth while enforcing "fair" outcomes at the same time. Hayek applies of course but his arguments are too abstract for most. Perhaps more concrete examples, such as Tom Woods gave recently about the unintended consequences of trucking regulation, are what is needed. But producing those is a lot more work than quoting Hayek. Where was this recent example on trucking regulation from Tom Woods? One of his podcasts? I'd really like to hear this take on those regulations. It was in my newsletter. But they think the people who made everything "unfair" will magically make it "fair". Or deliver the plunder to them. Of neither is going to happen. Potato Potato. Essentially a tightly regulated economy with fairness and redistribution is a centrally planned economy. But will he build a wall??? When Rand follows Ron he steps up. He should get over his "following in dad's footsteps" hang up. And good on him for pointing out that the real fascist threat has been growing for some time and comes from the top...the extremes are just a distraction from the main threat. Most who read EPJ know the reasons why America’s memory of the horrors of socialism has faded. For the same reasons we see the Lefties becoming more and more violent. These people have reached the point where they have so little ability to think for themselves they cannot form arguments sufficient for civilized debate. This combined with them being so propagandized that they not only will not accept that they are wrong, but that they believe they are so correct that their violent acts are warranted against those that merely express different views. This did not happen overnight. This is mostly a function of State run schooling focusing on training us to be automatons rather than developing the ability for critical thinking. Not many alive today developed skills in critical thinking from State run education. Those that have developed skills in critical thinking did so despite the State. I am old enough that my elders had sufficiently developed their critical thinking abilities that I was able to learn enough from them to develop more on my own. As each generation goes by this skill seems to be lost more and more, similar to a language that is spoken less and less. Today it seems that critical thinking and the ability to form arguments are not only taught less but are frowned on in schools as being disruptive. On top of this parents are relying on these schools more and more to raise their children (some of this due to the economic burdens the State has caused that require both parents to work full time). I think the solution to the problem that the majority of people are leaning in anti-freedom directions is to encourage the ability to think for ourselves and the skills for civil debate. Now that everyone is so connected by the internet, divisiveness and isolating ourselves into groups is on a more grand scale than ever before. There is more debate also, but proportionately the division is more prevalent. This is very bad for us on the freedom side because we are the minority. It doesn’t matter how correct we are when people have lost the faculty to reason while indulging themselves in the comfort of associating with those of similar opinion at the expense of learning. The tricky part is what is the best way to proliferate critical thinking? I think this is best done by asking people to defend their positions. Rather than telling them your positions, engage them in dialog as though you want to understand how the systems they endorse are supposed to work. This will force them to think. If there are flaws in what they suggest, these flaws will be revealed and can be pointed out. I understand I am not suggesting anything new. But it is all too easy to simply tell someone what you think and have them disagree and vice versa. The longer term is even trickier because this lack of thinking is institutional. I don’t see any other way to turn this around than to become the majority. What I find is that they cannot conceive of anything other than what they have been told to believe. Conditioned to think is right and the only answer. No curiosity. No willingness to learn outside the program they were given. The primary argument of people who think they are educated is first treat an idea foreign to them as coming from someone who missed school that day. Secondly comes ridicule. Then comes name calling. And finally threats of violence. This week on another website where it is general audience on a topic unrelated to libertarianism or economics but has a thread about gasoline being sold for $20/gal in Texas I got responses that were all of these for posting what all of his here know about the price mechanism. There is a certain insanity now. Anyway, I always say liberty is doomed until the government loses the schools. They took the schools first to build this monster and so long as they have the schools any victory of liberty will be temporary. Alex, excellent analysis. What comes to mind as a solution is a rebirth of scholastic form, with a proposal, arguments for, refutations of arguments for, and so on. Also, the egalitarianism that poisons young minds because of the government schools leads to a relativism that any opinion is just as good as another, with no attempt to find truth, since no one believes that truth is a thing. We already have a statesman. Trumpussolini isn't a statesman, he's a buffoon who knows ZERO about economics or government limits. He said in another speech that he wants the federal reserve to be more effective. There is much, much more but I will spare you. This guy isn't a statesman, he's a looney tunes. Rand is definitely a bright light in the cesspool that is DC, but that's not a high hurdle. I don't mean to diminish his relative exceptionalism, but I don't think he's ever going to measure up to Ron. He capitulated on principle too easily in the presidential race, which Ron never did. And it seems as if he hasn't read the same books as his father did; I'm guessing that if Ron were to talk about the collapse of the Soviet Union, he would rely on Mises' argument about the real problem being economic calculation, not Hayek's argument about the lack of knowledge (among others, Joe Salerno has written on the relative merits of these two lines of thinking). When a medical marijuana CEO shows you up on sticking to your guns you definitely have an issue. But Mises wrote an entire book on the subject of lack of knowledge called the Anti-Capitalistic Mentality.